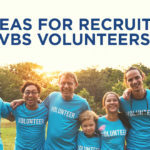 As kidmin leaders, we spend a lot of time and resources trying to find and attract unchurched families through VBS, carnivals, egg hunts, and countless other “y’all come” events. We often rush to the conclusion of one event just so we can get on with the next. Without realizing it, we have jumped on a hamster wheel of prospect gathering that never slows yet produces few results. What if we stopped spinning long enough to take a good look at the prospects already discovered through this summer’s VBS? Statistics tell us 10% of the people who attend VBS are not connected to a church. On average, that’s 10 people (mostly kids) per church, but when family members are added to the equation the number of prospects discovered grows to 35! Now that’s something to celebrate! However, statistics also tell us we establish ongoing relationships with only 1% of the unchurched who participate in VBS. We have successfully found and attracted unchurched families, but we didn’t keep them. 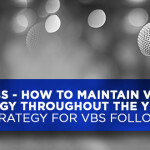 The biggest issue seems to be the lack of an intentional plan to build upon the relationships begun during VBS. While we planned how to find prospects, we haven’t planned how we will keep them. Here are six steps that help us go beyond finders to become keepers. Step 1: Create a follow-up plan that focuses on building intentional relationships not just assimilating information about the church. Step 2: Intentionally connect with the entire family, not just the kids. Don’t become so focused on the kids you ignore the parents. Step 3: Train volunteers to be connectors (relationship initiators) instead of greeters. Greeters welcome guests then leave them on their own. Connectors welcome guests and make sure they are connected to others. Step 4: Work with ministry leaders to connect parents with church members through ongoing ministries such as women’s and men’s Bible studies and support groups. Step 5: Work with adult ministry leaders to create connection opportunities such as a new Sunday morning Bible study group for unchurched parents to connect with each other. Step 6: Stay focused on working to keep the unchurched families you have already found.